Rangers’ trip to Ochilview, and Falkirk’s reunion with Blair Alston will both be screened live on BT Sport. The broadcaster has chosen the Bairns’ trip to Perth as one of their featured matches as fixtures were finally announced today after last Friday’s draw. They have also included Championship winners Rangers’ trip to relegated East Stirlingshire as one of THREE televised matches involving the Ibrox club. Stenhousemuir also learned they would host Glasgow sides Queen’s Park and Partick Thistle at Ochilview but are travelling to Queen of the South and Airdrie. The tournament kicks off on Friday, July 15 with Falkirk in action on July 16. 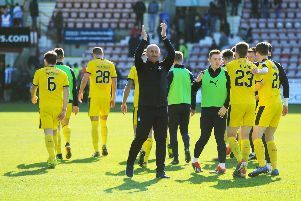 East Stirlingshire and Stenhousemuir must wait until Tuesday, July 19 to play their first games in the tournament with Shire only playing one of their four matches at 3p.m. on a Saturday. Brechin City (H), Saturday, July 30, 3pm. Queen’s Park (H), Tuesday, July 19, 7.30pm. Partick Thistle (H), Tuesday July 26, 7.30pm. Queen of the South (A), Saturday, July 30, 3pm. Annan Athletic (H), Saturday July 30, 3pm.